So, we got the left and right GUI Repeat Buttons buttons working now (the dark blue buttons with the <- and -> text in them. They’re actually more of a semi-transparent grey but they’re on top the 2 blue blocks marked with a X which are the walls. I will probably have to increase them a bit more in the future to ensure the guy doesn’t jump over them. Oh, the island moves too and bounces back and forth when it hits the blue walls. It’s going at the constant rate at the moment though. Bugs have already started creeping in. I found out the the guy was jumping way too high on iPhone 5 dimensions and this was fixed by scaling the gravity and jump force with the scaling of everything else. Then there was the bug where the the pause button wouldn’t click because it was on top of the blue wall. 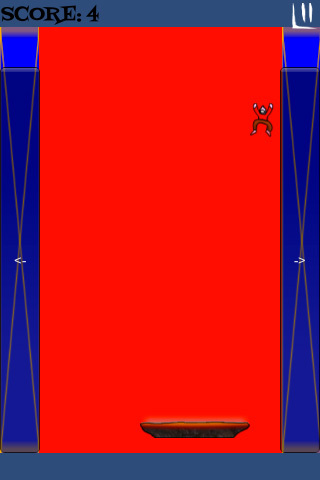 I fixed it by changing the 2d hit box into a 3d hit box. What’s next: adding the item that increases score and having the platform’s speed be affected by the score. Adding the wing item would be nice too, as well as reset the guy back to the top when he falls to his doom.